This broken base of a Dalton point was found by Bruce Arnett, near Boonville, Missouri in Howard County. It’s important because it relates to fluting technology and illustrates that some Dalton points were fluted. 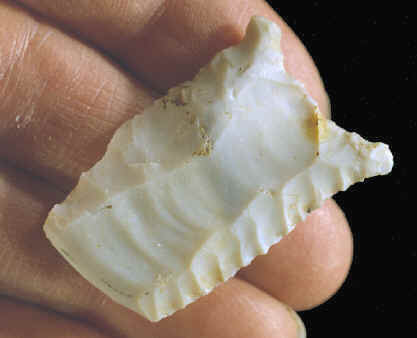 This fairly rare specimen exhibits a break pattern that is not commonly associated with projectile points from the Early Archaic period. It was discarded after it was broken during manufacture. This same fracturing mistake is more commonly seen on stone tool manufacturing sites that date to the Paleo-Indian period. This Dalton point was broken when it was struck on the base in an attempt to drive off a long narrow channel flake. Instead of thinning the base by fracturing off the surface, the flute flake dove inward causing the point to break apart. The remnant of a prepared striking platform is clearly evident on the base. This Dalton point base is made of good quality white chert and measures 1 5/8 inches (4.1 cm) long.